Most home inspectors base their rates on the size of home, number of bathrooms, type of foundation system. Typical pricing is $300 for homes up to 3,000 sf of HVAC area. For homes larger than 3,000 sf $0.10 per sf is a good estimate. Pool inspections are $150 or an additional $100 if done with a home inspection. Call or check our website for any special pricing or discounts. How does the scheduling process work? Just give us a call, text with or email your contact information along with the best time for us to talk with you and we will contact you shortly (usually within 24 hours). We will give you a verbal quote on the cost of your inspection. If this is agreeable with you, a tentative date & time will be set that meets your needs and our availability. We will need the contact information of your realtor so we can schedule access with the seller. Once that is done we will email a pre-inspection agreement, just sign it electronically on your phone or computer and we call or text you confirming your inspection scheduled date & time. What do you cover during the inspection? We visually inspect the readily accessible areas of the home and its operating systems, including the foundation, exterior drainage, any vegetation affecting the home, driveway & side walks, roof & gutters, siding, windows & doors, decks & patios, pools, attic, electrical system, plumbing system, HVAC system, structure, interior floors, walls, and ceilings, kitchen, bedrooms, bathrooms, and other interior areas. What type of report do you have. We produce a very detailed, easily readable report usually 30 pages or more. All reports are generated using a software system that details current condition of area or system and generally includes pictures with arrows or other means to identify any defects. This report can used to check any repairs during final walk through. Yes Quality Vision Home Inspection, LLC licensed and insured company and I am licensed by the stat of Alabama as a Home Inspector. 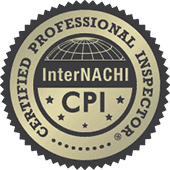 I am also member in (InterNACHI) International Association of Certified Home Inspectors. Pricing is dependent on the homes size, age, type of foundation system & number of bedrooms and bathrooms. Call us and we will be happy to give you a quote over the phone. We encourage you to get a number of quotes we feel we offer a premium service at very competitive prices. No, it is not required. However we encourage attendance especially by first time home buyers because it allows you the opportunity to get to know the house better and lets you ask questions that will save you time and money later. We pride ourselves on educating clients both on the current homes condition and how to maintain it once purchased so you avoid any undue expenses. We are always happy to hear our clients questions even months after an inspection. Just give us a call. If we don’t answer the phone leave a message and you will get a return call. We value your relationship and are eager to assist you with knowledge and integrity. Do you offer a re-inspection to make sure any repairs were properly done? YES! We are happy to offer a re-inspection at or before final walk through in the Birmingham & Tuscaloosa metro areas for $100.